Was Windows Phone always doomed to fail? At one point there seemed to be genuine consumer interest in Lumia phones. To make sure we aren't imagining things, let’s look at some cold, hard numbers to find out. Here's the number of new Windows devices launched each year. 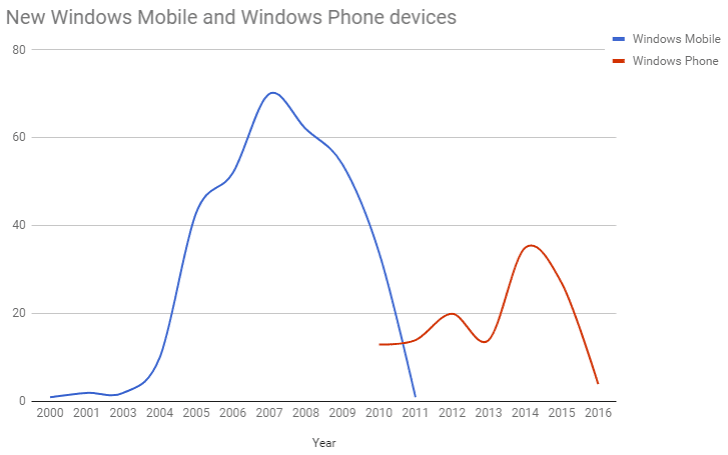 We’re including both Windows Mobile and Windows Phone as there was a time when heavily skinned versions of Mobile ruled the land (aka, “The Golden Years of HTC”). Users quickly warmed up to the new platform, but it seems that there wasn't much loyalty on both sides. Windows Phone 8 was announced in 2012 and it quickly became clear that Windows Phone 7 users will need to buy new devices. You can see in the chart how well that news was received - from 2013 it was all downhill. Do you think that we’re wrong about Android’s eternal hegemony? Because we have a graveyard with Firefox OS, Tizen, Sailfish and a few others we can turn to for historical data. Sure, they live on in some ways – Firefox now powers featurephones, Tizen is the better non-Apple smartwatch OS, Sailfish wants to create a market for aftermarket OS installs... And yet they are more of a rounding error in smartphone statistics.